Tropical soda apple is commonly seen in pastures this time of year. As I’ve been driving around the state over the past few weeks, I have noticed that tropical soda apple (TSA) is very evident in pastures. I had been waiting on someone to ask why they seem to be increasing this time of year, and I finally received that phone call late last week. There are several reasons why TSA is increasing, or at least why we are seeing more this time of year. The first reason is that TSA has the capability to germinate year-round, but we have observed more germination in the fall/early winter than at other times of the year. If seeds germinate in the summer, our summer rains typically keep the seedlings from becoming established because TSA seedlings do not survive well in wet/saturated soil conditions. Also, growth of our forage grasses is usually at its peak during the summer months, which helps prevent TSA seedling from becoming established. This time of year, however, forage growth diminishes, resulting in less grass competition with the TSA seedlings. Now, add in the residual soil moisture and we have a perfect way for TSA seeds to germinate and become established. A second reason could be related to Hurricane Irma. Rainfall exceeded 9 inches resulting in localized flooding in many areas. This resulted in decreased forage growth and death of the forages in some cases. Since we were nearing the end of our growing season for our warm season forages, they did not have much time to regenerate to help prevent weed seedling germination. Some may be asking “Why is GrazonNext HL not preventing TSA from germinating in my pastures? I sprayed my pastures with GrazonNext HL this year, and I still have TSA plants becoming established in my pastures. GrazonNext HL is supposed to provide residual TSA control.” This is a good question. Like all residual herbicides, aminopyralid (the component of GrazonNext HL that is responsible for providing residual TSA Control) residual activity is subject to environmental conditions. On average, the half-life of aminopyralid is approximately 104 days and is weakly sorbed to soils. The half-life can be dramatically shortened by increasing temperature and rainfall. Therefore, we should not expect residual soil activity in our environment for more than 6 months, especially when rainfall has been above normal. 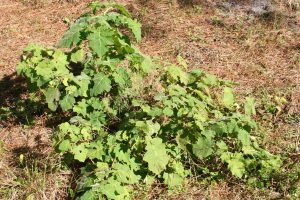 Another reason may be related to the population dynamics of the TSA beetle, Gratiana boliviana, which is considered one of the best biocontrol success stories so far in Florida. 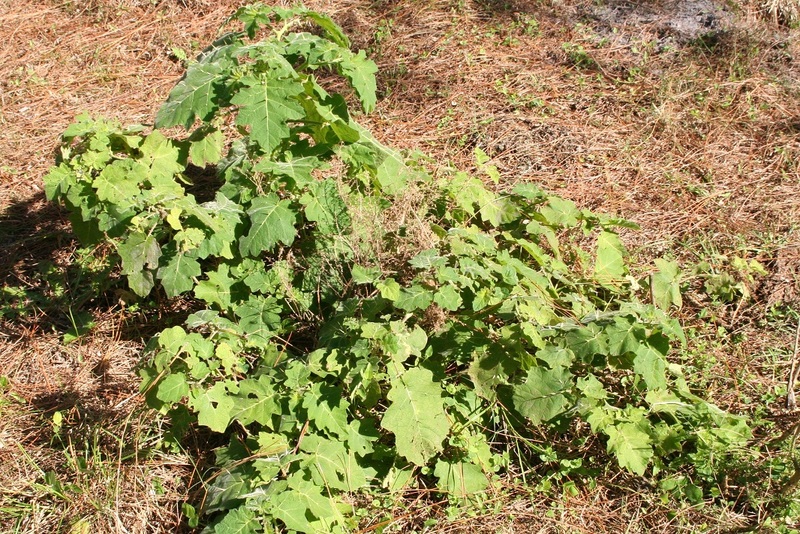 For several years, we observed relatively few TSA plants throughout central and south Florida following the release of the TSA beetle. As the TSA population began to decline from both herbicide applications and the introduction of the TSA beetle, the beetle population also declined due to the lack of TSA plants for a food source. 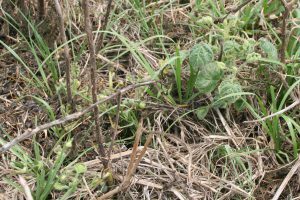 Although TSA beetle populations likely increased this year due to the increase in TSA plants this spring and early summer, they are likely in diapause at this point in time and will not reemerge until late March or early April. What are my options for control? The best option remains GrazonNext HL at 24 oz/A for broadcast applications or 1.5 oz/gallon of water for spot-treatment. Another good option is triclopyr (Remedy Ultra, others) at 2 pt/A for broadcast applications or 1.5 oz/gallon of water for spot treatment. If you have already treated your pasture with GrazonNext HL in 2017, you should wait until 2018 to apply again, unless you are spot-treating. Several have indicated that they are using glyphosate as a spot-treatment. While glyphosate is cheap and effective, keep in mind that overspray will kill your desirable forage, and usually allows for more TSA seed germination and establishement. Remember, we need the desirable forage to help keep TSA seeds from germinating. Regrowth of TSA 2 months after treating plants with GrazonNext HL right after a frost. Regrowth from the root system is initially distorted, but these plants set fruit within 5 months after application. This shows the importance of plants being actively growing prior to herbicide application. Another caveat to optimum TSA control is that the plants must be actively growing prior to herbicide application. We woke to a light frost this morning in the Ona area, which will likely hinder herbicide activity on TSA plants; so wait for new growth on plants prior to herbicide application. Although I don’t like to see frost very often, it could actually help decrease the amount of TSA in our pastures. If you want more information on TSA, please visit our fact sheet for TSA Biology and Management.